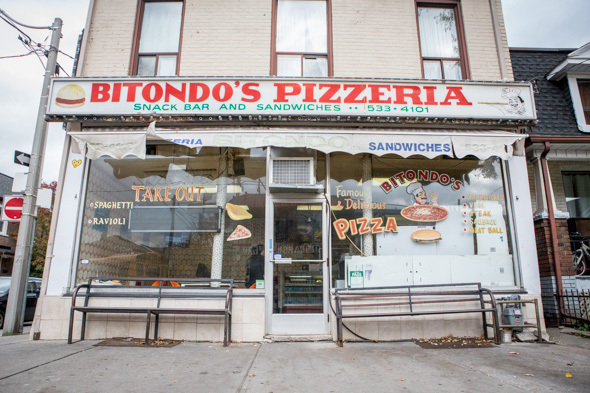 Bitondo's is a tiny, old school pizzeria located on Clinton, a residential street removed from the bustle of Little Italy's main drag. It's a strictly take-out operation, which you'd think would hinder business, but it thrives thanks to a loyal following, despite the fact that San Francesco Foods (with an almost identical menu) is situated directly across the street. The place has seen better days. Outside, the awning is tattered, the windows haphazardly covered with cardboard to shade the pizzaiolo. Inside is worn too - the brown backlit menu board lists sandwiches, slices and pastas, while a white printed chart supplements the menu with pizza offerings. A cold case displays bottles of Brio, salami and containers of olives, while a hot case is balanced on top and stocked with ready-made pizza slices and golden panzerotti. 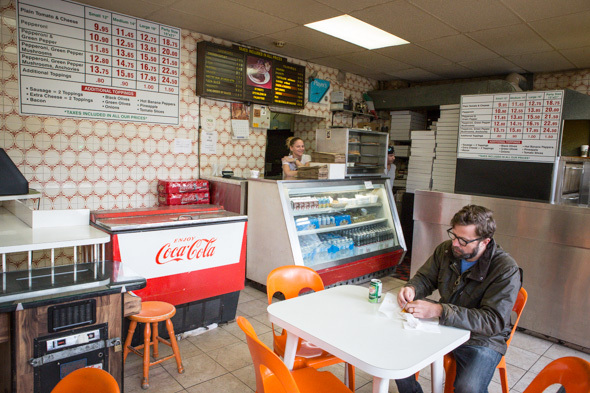 Seating is limited to just a handful of tables furnished with orange chairs, and are generally filled with singles mowing down a slice or waiting for their orders to be ready. I was first introduced to this joint when I was in my 20s, renting a grubby room on College Street. 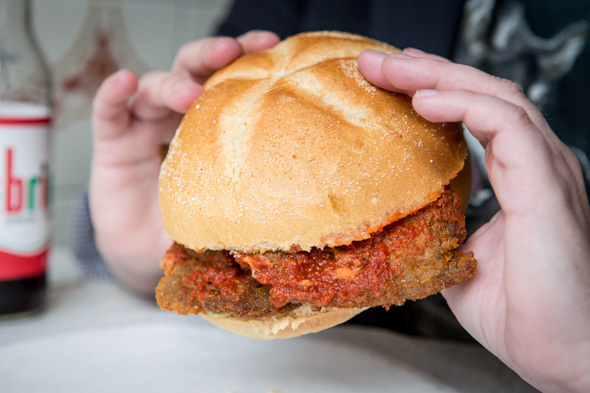 My roommates at the time pronounced it Bit- aan -dos (an affectation I've since struggled to shake), and they taught me that the sandwiches (specifically veal or chicken) are best consumed by peeling off the top bun and re-stacking with a gooey cheese panzo set in the middle. Considering the tiny pizza parlour offers no real sides, it was a perfect way to fill up on the cheap. Really, there is no wrong way to eat Bitondo's. The slices ($3.50) topped with pepperoni beckon from under an orange glowing light. 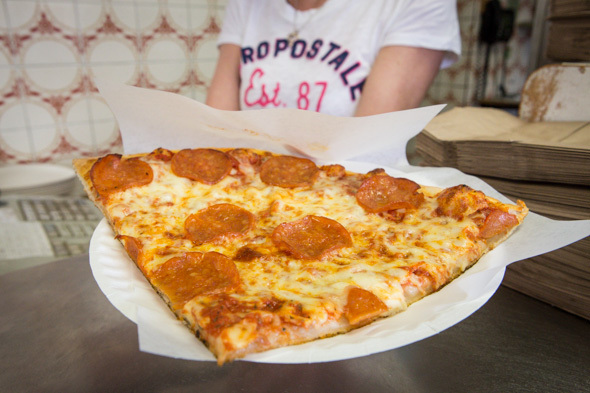 The crust is thin, but firm; the cheese is melted to a gooey consistency but not cooked enough to brown or crisp up; the pepperoni is incredibly salty and greasy. 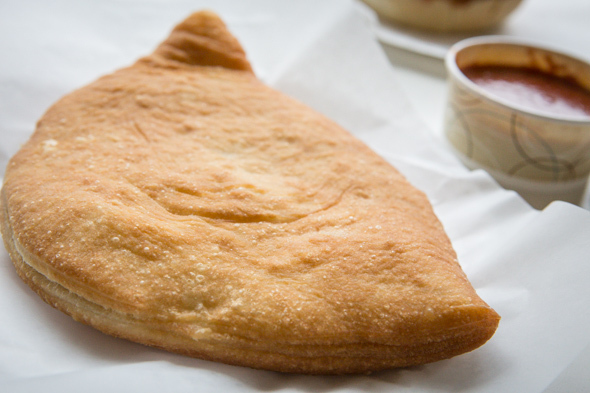 During peak hours you'll find cheese panzos ($6.50) ready for grab-and-go too - you'd think they'd be best straight from the fryer, but they don't sit around long so it's not really a concern. Even if you call in to order in advance, they won't make it just for you - the standard reply is "order that again when you come to pick up". Should you arrive to find them sold out, consider the wait for a fresh one a blessing. A side order of sweet, bright sauce ($1) is advised for dipping. 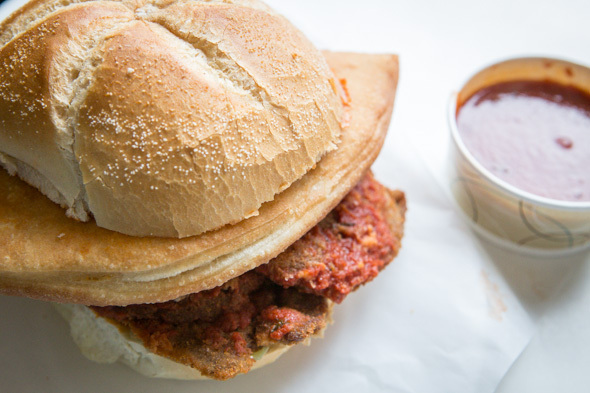 Skip the pastas - these take 30 minutes and are nothing to write home about, and order instead from the list of sandwiches ($5.75 to $6.95) featuring chicken or veal cutlets, steak, sausage or meatballs. These are served sweet, medium or hot with extras ($0.75 each) like sweet peppers, mushrooms or extra cheese (not necessary if you plan to stick a panzo in the middle). 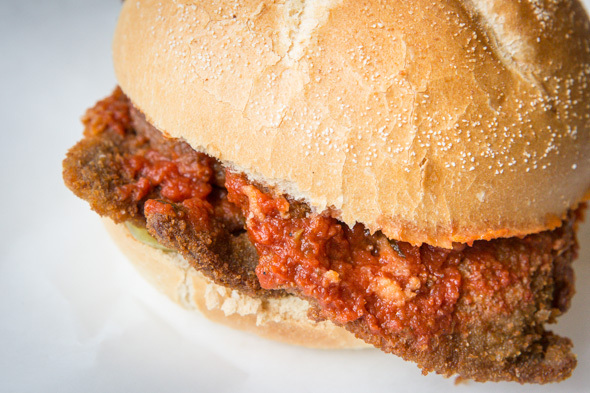 Sadly there is no eggplant (the only excuse, IMO, to go to San Fran across the street), so in its absence I always get the veal, a generous stack of thinly pounded, breaded meat. I like it "medium" which means smothered with sweet, thin red sauce and dressed with rings of hot banana peppers. Whole pizzas start at $9.95 for a 12-inch cheese and go up in price depending on size and number of toppings. House favourites include any combination of pepperoni, green peppers and mushrooms but there are also extras (nothing fancy) like bacon, sausage, olives, onions, tomato slices, pineapple and hot peppers available if you want to customize. Specify "well done" if you want the cheese to bubble and crisp. Above all you need to know that Bitondo's only accepts cash - which can be obtained across the street at the Monarch Tavern .